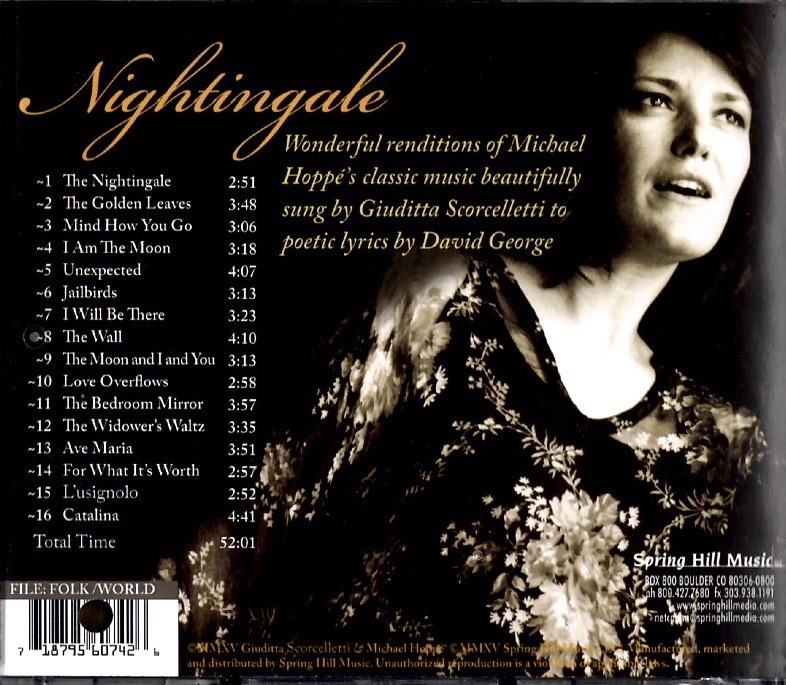 “It is difficult for me to adequately convey the excellence of Nightingale, an album featuring the music of Michael Hoppé, with lyrics by David George and the heartrendingly gorgeous voice of Giuditta (Scorcelletti). It is one of the most beautiful collections of songs I have heard in years. Featuring Giuditta’s husband, Alessandro Bongi, on guitar and keyboards (and a few other guest artists as well), these songs are finely wrought jewels, each with its own alluring facets that will entrance you. Giuditta’s voice is the perfect blend of intimacy and drama and the music’s influences are a mixture of folk and Mediterranean (all but two songs feature English lyrics)”. Michael Hoppe’s incredible music has gone through many incarnations over the years – in collaboration with piano, flute, cello, harmonica, symphony orchestra, behind recited poetry and prayers, etc. Nightingale, his newest release, came about purely by accident – or destiny. Hoppe and lyricist David George had co-written a number of songs and had been searching for the right voice to sing them for a long time. Hoppe made his singing debut on his 2013 release, Grace, singing “Love Overflows,” but the other songs remained unreleased. When Hoppe and his wife were in Tuscany the summer of 2013, they visited the town of San Gimignano. While on an afternoon walk, they heard a woman strumming her guitar and singing “in a most beautiful voice.” She was selling her CD of Tuscan folk songs and Hoppe bought one, leaving his business card and contact information in her basket. When Hoppe and his wife returned home, they had an email from Giuditta, who had researched Hoppe’s music online and asked if she could record “Love Overflows.” Her version was so beautiful that they decided to do a whole album of music by Hoppe and George, produced by Giuditta’s producer/guitarist husband, Alessandro Bongi. The results are stunning! Giuditta’s voice is perfectly suited to Hoppe’s heartfelt melodies as well as George’s poetic lyrics. Known as a folk singer in Italy, Giuditta Scorcelletti’s voice is strong yet delicate, passionate and pure, and without affectation. The instrumentation is simple and is mostly acoustic guitar, but a few of the sixteen tracks have subtle flutes, keyboard, bass, cello, and others. However, it is always Giuditta’s voice that is front and center. Michael Hoppe has been one of my very favorite artists since the late 1990’s, so some of these songs are very familiar as he has created different versions of some of them, but Giuditta’s fresh interpretations make them sparkle as if brand new. David George’s poetic lyrics cover many subjects and Giuditta’s lovely voice brings the words to life. This album is a rare treat for the senses, and one that came about through what Hoppe calls a miracle – it was just meant to be! Sure to be one of my Favorites for the year, Nightingale is available from SpringHillMedia.com, Amazon and iTunes. I give it my highest recommendation! Nightingale CD on Spring Hill Media/Linus Entertainment performed by Giuditta. 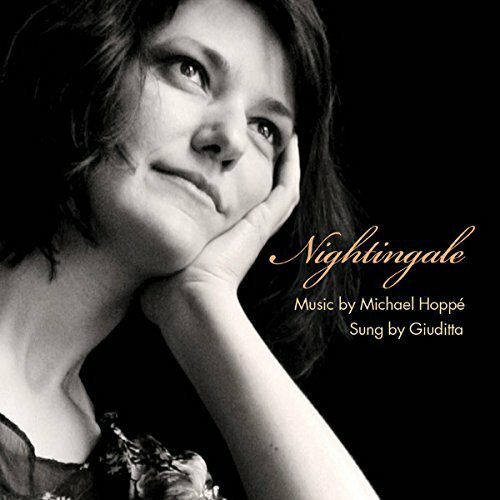 April 14th, 2015 saw the Spring Hill Records/Linus Entertainment release of “Nightingale”, a collection of songs by Grammy nominated Composer Michael Hoppé, with Lyrics by David George – performed by Giuditta Scorcelletti & Alessandro Bongi. Michael Hoppé’s 25 plus instrumental albums include the Grammy nominated CD “Solace”. Michael’s music and David George’s words look to the timeless classics for inspiration. This will be the first time lyrics will be featured alongside Michael Hoppé´s celebrated music. Former A&M Canada recording artist, David George, was delighted to add lyrics to many of Michael’s melodies – some newly composed and some more familiar which Giuditta’s naturally sensual vocals bring to life. The unique guitar stylings of Allesandro Bongi with a variety of talented International musicians made this real-time collaboration possible in the age of the Internet. David George’s Independent CD It’s a Beautiful World , yielded the song “Catalina” (music & lyrics by David George) beautifully covered by Giuditta, the new version is included in the CD “Nightingale”. From Michael Hoppe in San Miguel de Allende, Mexico; David George in Los Angeles, California, Giuditta & Alessandro in Tuscany, Italy, we invite you to listen to Giuditta and the songs of the “Nightingale”. We stood there both captivated and enchanted. I noticed she was selling her CD of Tuscan folk songs (“The Voice of Tuscany” sung by Giuditta Scorcelletti) and I decided to buy one. Placing the money in her CD basket, I also included my business card which had my contact information. Several weeks later when we had returned home, I received a surprise email from Giuditta saying she hoped I had enjoyed her album and that she had gone on-line to research my music. It appeared the music really spoke to her. She inquired if she might record one of my songs, “Love Overflows”, which I had recently written with lyricist David George. Giuditta sang a beautiful version of “Love Overflows”. This led her and her producer/guitarist husband, Alessandro Bongi, to record a whole album of my music featuring David’s lyrics. Frankly, David and I had been waiting for years for the right voice. Through this chance meeting in San Gimignano and a fortunate placement of my business card, a miracle occurred…we had finally found the voice we had been looking for so long! As you will hear, Giudiita sings like a nightingale. We are so grateful her lovely voice graces our songs.